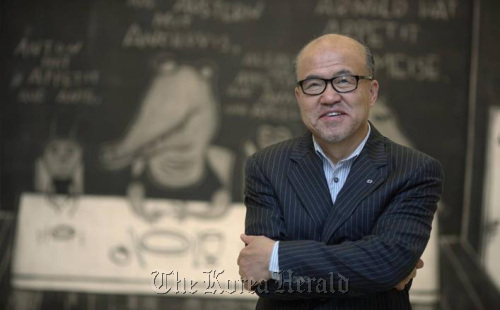 Arario Gallery in Cheonan, South Chungcheong Province said on Monday that its president Kim Chang-il, 59, is among the world’s top 200 collectors according to the editors of ARTnews, a U.S. magazine. Kim made the ARTnews top 200 list in 2006, 2007 and 2009. In 2007, he was ranked 87th on the list of the world’s 100 most powerful collectors selected by Art Review, a British magazine published in London. He was the first Korean ever to make the Art Review list. Among the world’s top 200 collectors are Charles Saatchi, a British advertising tycoon and owner of Saatchi Gallery, who collects contemporary art, especially British; Damien Hirst, a successful artist; and Helene and Bernard Amault, chairman of LVMH, a French luxury goods maker. ARTnews, an art magazine founded in 1902, surveys collectors, dealers, auctioneers and curators every year to release the world’s top 200 collectors’ list. Kim Chang-il, unlike most artists who struggle financially until they make it big, is a self-made multimillionaire and the owner of one of the largest contemporary art collections in the world. It was after he became rich that he became an artist. After university where he majored in business, Kim took over the dusty convenience store his mother was running inside a bus terminal. He revamped the store to give it a modern look and business took off. Soon, he had enough money to buy the entire bus station. Over time, that evolved into an empire of department stores, restaurants, cinemas and galleries. Kim Chang-il, president of Arario Galley in Cheonan, South Chungcheong Province. Kim displays many of the works he’s accumulated in the Cheonan gallery. There, outside his Arario Gallery, sculptures by great contemporary artists such as Keith Haring, Damien Hirst and Armand Fernandez are on display free for the public. He also owns galleries in Seoul, Beijing and New York. Throughout his devoted art career since opening Cheonan Arario Gallery in 2002, Kim is known to have set a precedent for commercial galleries in Korea, by exclusively taking emerging artists under Arario’s wing. Before Kim, Korean commercial galleries rarely represented young artists on an exclusive, contractual basis, nor provided long-term financial support.